The residential U.S. solar market is growing fast with the help of new capital and new financial products. There is a wave of consolidation and shifting alliances underway in the U.S. residential solar market. We've seen market leader SolarCity on an acquisition spree, and Vivint is in a fierce personnel and turf battle with the market leader. Last month Sunrun acquired REC Solar's residential group. There seems to be a move toward vertical integration. Here's some recent news from official and unofficial sources. The most recent dynamic in this market involves Sungevity, the Oakland-based solar financier and lead generator, and Clean Power Finance, the solar loan and deal platform. It's not a vertical integration move. According to sources, Sungevity is moving some of its leasing business to the turnkey Clean Power Finance finance and deal platform. Sungevity is also moving to offer a power purchase agreement. 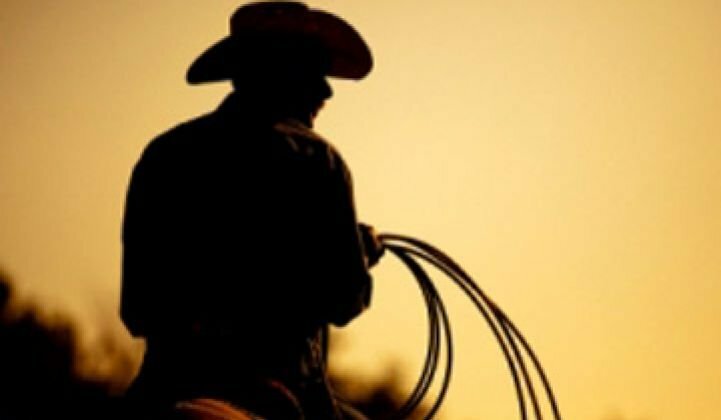 Currently, most of Sungevity's leasing finance comes through dedicated tax equity funds with a sponsorship model that requires Sungevity to contribute to the financing, a less-than-optimal use of venture investor equity funding. Sources close to the deal have suggested that the sponsorship equity model is expensive for Sungevity, while CPF needs to offset some of its losses from the SolarCity-Paramount deal. We have also learned that Sungevity has some issues with finance timing. According to sources, a very significant number of solar systems are installed on customer rooftops but are not yet energized because Sungevity does not have the funding. We understand that this is not uncommon, as banks might just do one tranche per month for their customers, so Sungevity's customers might have to wait a month. It is an easier situation to manage if there are multiple open funds. A few reviews on Yelp (one example is below) bolster the claim that sales reps are telling customers that Sungevity is waiting for financing. I contacted this Yelp reviewer, Scott R.D. He wrote that Sungevity informed him that it was "waiting for approval of [its] 'financing partners.' That was going to be a few weeks. This was a day or two after they put the equipment on my roof. It is pretty much ready to go, except for wiring into our electric panel. He said that would only take a few minutes and they would do it right before inspection. I've spoken with my assigned project manager and Sloane Morgan, Customer Experience Officer." Scott also pointed out that "[t]he lease agreement states that they will not put equipment in until they have approval of their 'financing partners.'" He was sent a $100 gift card for his trouble late last week. Sungevity has plenty of positive reviews on Yelp as well. 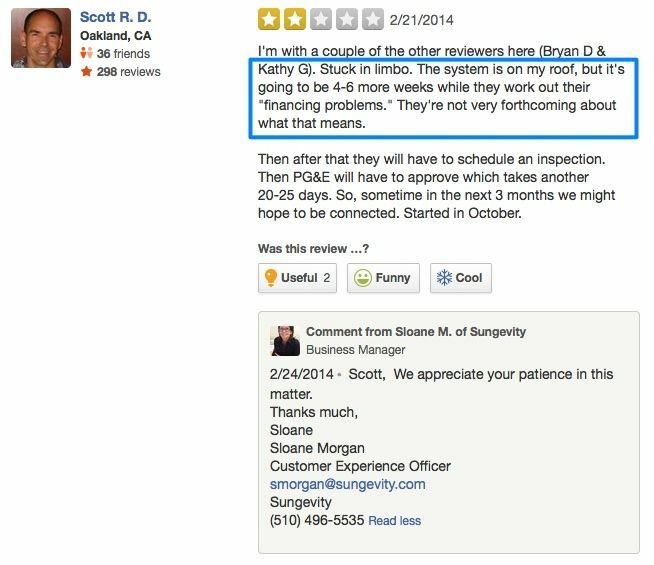 Stephen Lacey's story on the best and worst Yelp reviews of solar installers goes into detail on the topic. He also notes that "it's important to look at a reviewer's full history before making a judgment." Vivint, the second-largest solar installer in the U.S., didn't disclose the terms or source of its three new equity transactions, which will enable the funding of $280 million worth of solar systems. Vivint gained more than $700 million in residential solar financing last year. "In 2013, we grew our customer base by nearly 300 percent with our past fundraising efforts," said Greg Butterfield, CEO of Vivint Solar, in a release. Vivint Solar expects to open up 30 new offices this year. RGS Energy (RGSE), a solar installer and financier, has partnered with Mosaic, an online solar investment platform, to launch a home solar loan product. RGS Energy aims to offer the loan to California homeowners starting in the first half of 2014. Mosaic's online platform will offer opportunities to invest in the solar loans to qualified investors. Billy Parish, Mosaic’s president and co-­founder, told GTM, "The loan is a great new option for homeowners who want to go solar. Mosaic’s Home Solar Loan [requires] zero dollars upfront and simple low monthly payments, comparable to most leases. At the end of the loan term, the homeowner has increased their home value and gets free energy for up to 25 more years." According to the VP of GTM Research, Shayle Kann, "The market share of third-party ownership has largely leveled off over the past six months, and we expect to see increasing availability and attractiveness of residential solar loan products this year." Here's a residential solar roundup from January.